This guy lives not far from me and always has a couple of interesting vehicles for sale in front of his house. 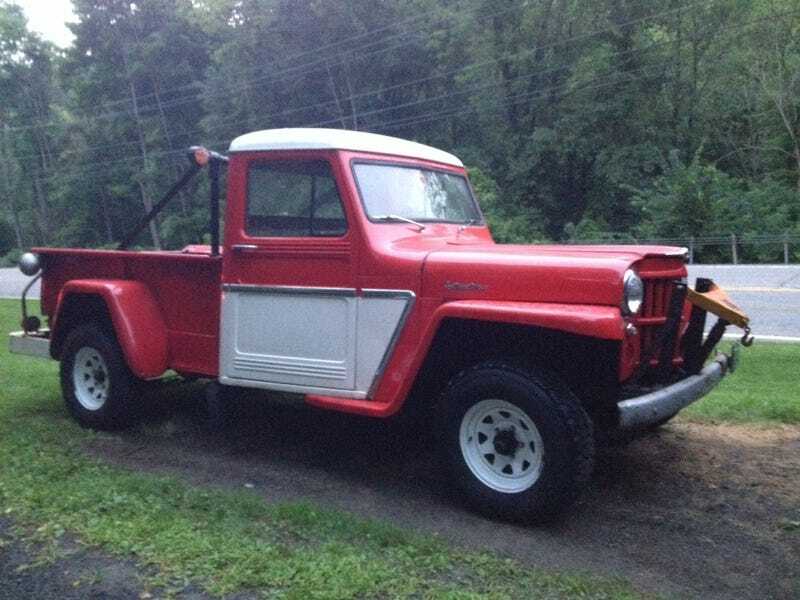 Tonight, I finally felt compelled to stop- and was rewarded with a walk-through of a couple of Willys pickups. The one with paint is a '61, registered in Vermont and with a working Fisher plow attachment / along with the other plowing additions like the reverse light and the yellow flasher. The other is a '54. Lots of cool stuff here. Original 16" wheels, the "4 wheel drive" paint you may have seen reproduced in decals on the Willys wheeler edition wrangler, Bakelite all over the interior, the font on the tachometer, the apparent lack of a speedometer... And then under the hood. The paint thinner can is the gas tank, apparently. The longitudinal rod that holds up the rod that holds up the hood... And the beautiful 2-foot long horn! Not to mention that intoxicating smell of 50-year-old oil. Unfortunately, the owner wants $8000 for each - I'd start being tempted for around half that. What do you think?